Every year, thousands of burlesque professionals, peers and fans vote for their TOP 50 Burlesque Industry Figures, and the results are in for the Burlesque TOP 50 2016. If you are new to this extremely popular process, please read the Burlesque TOP 50 Essential Guide here. Coming to New York in May 2017 with a spectacular new event. 2016 Appearances: New York Burlesque Festival, Minneapolis Burlesque Festival, Texas Burlesque Festival, Vancouver International Burlesque Festival, Burlesque Hall of Fame Weekend. 2016 Appearances: Mason Dixie Burlesque US Tour, Twirly Whirly Burly-Q 2016 Tour, solo European tour. Co-Producer and founder of Speakeasy Burlesque including Le Grand Cabaret starring Dita Von Teese. 2016 Appearances: Performances in Montreal, Bike & Tattoo Show Canada. Stage manager for countless prestigious burlesque productions including Burlesque Hall of Fame Weekend, Viva Las Vegas Rockabilly Weekend Burlesque Showcase, and the New York Burlesque Festival. Professional stage manager since 1998. 20 years experience working in the performing arts (backstage and onstage), and over 15 years experience in burlesque. BA in Theatre, Music and Dance. 2016 appearances include the Smoky Mountain Burlesque Festival as ‘The Bishop of Burlesque’. 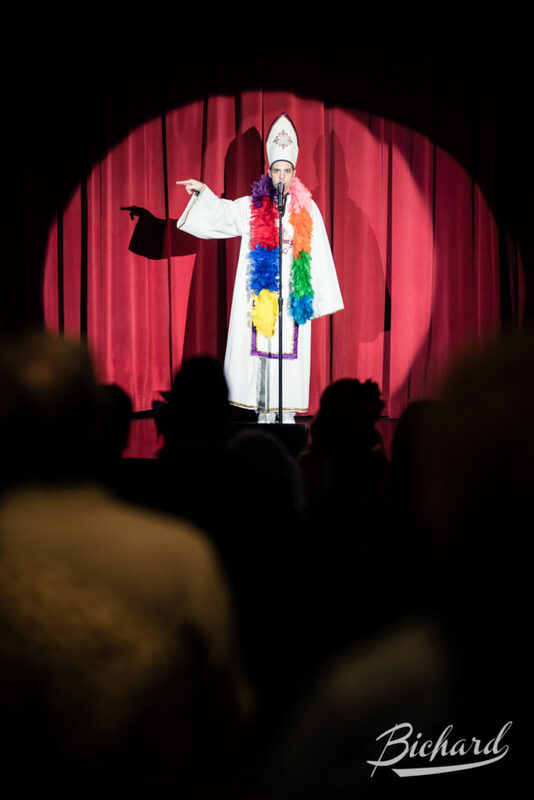 The Bishop of Burlesque, David Bishop, leads the crowd in his customary burlesque blessing at the Movers, Shakers and Innovators showcase at the Burlesque Hall of Fame Weekend 2016. Image copyright John-Paul Bichard. 2016 Appearances: 2016 Tour of Europe (Germany, Paris, Italy). Performer: Texas Burlesque Festival, Viva Las Vegas Burlesque Showcase. Headliner: Oklahoma City Burlesque Festival, Arizona Burlesque Festival. Featured Producer: Texas Queerlesque Festival. Coco Lectric in the Viva Las Vegas Burlesque Showcase, April 2016. ©Chris Harman/Harman House Photography for 21st Century Burlesque Magazine. Not to be used without permission. 2016 Appearances: Headliner: Minneapolis Burlesque Festival, Smoky Mountain Burlesque Festival, Burly! Burlesque for the Boys: Official Tampa Pride Pre-Party. Performer: New York Burlesque Festival, New York Boylesque Festival, Theatre Bizarre. 2016 Appearances: Performer: Caput Mundi Burlesque Awards, (Italy) Cariad Ink Tattoo Festival (Wales), Haworth Steampunk Weekend, Filly Follies Velvet Voyage (Munich) Burlesque on the Beat (Lyon). Headliner: Hebden Bridge Burlesque Festival 2016. 2016 Appearances: Headliner: Rome Burlesque Festival, Barcelona Burlesque Festival. Performer: Bohemian Burlesque Festival, Berlin Burlesque Week. Proprietor of Manuge et Toi Corsetry and Burlesque Costume Design. Creating bespoke corsets and lavish costumes for clients all over the world including Dita Von Teese, Roxi D’Lite, Kalani Kokonuts, Sassy Von Straddler, Coco Framboise and Tanya Cheeks. 2016 Appearances: Performer: Dita Von Teese’s Strip Strip Hooray! tour 2016 (Australia and US), Dallas Burlesque Festival, Houston Burlesque Festival, Viva Las Vegas Burlesque Showcase.